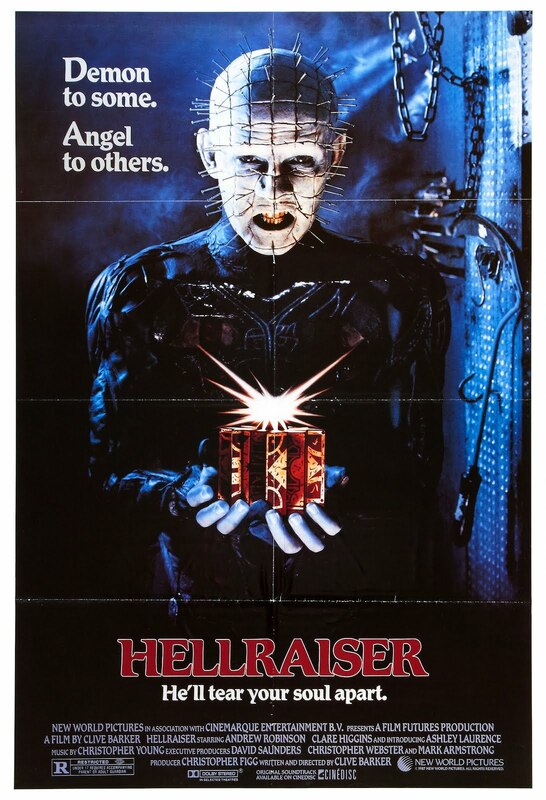 The Rockport Film Review: "Hellraiser" Starring Pinhead and the Cenobites! 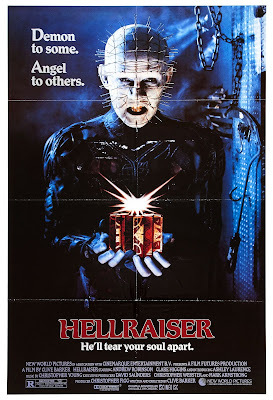 Clive Barker's "Hellraiser" is an 80s horror classic with gore effects that still hold up today. It also introduces us to a new horror icons Pinhead and the Cenobites (sound like a band I use to know). I actually saw this movie when I was about 10 years old and can't believe how well the film has held up after all these years. Some of the movies haven't aged as well though as in the ending. Julia is a businesswoman who had a torrid affair with her husband Larry's brother Frank, a dark and mysterious world traveler. When Frank dies under suspicious and supernatural circumstances Julia and Larry move into his house (naturally). Larry also has a daughter, Kirsty, from his first marriage who now lives on her own. While helping the movers Larry accidentally cuts open his hand on a nail and goes looking for Julia. He finds her in the attic where Frank died. Larry's wound bleeds on the floor, which intern starts in motion the resurrection of Frank. A while back Frank had bought a puzzle box from a street vendor. It's like a Rubik's Cube, but if you solve it opens up a doorway to hell. The box summons the sadomasochistic demons known as the Cenobites, whose only pleasure is your pain. With Larry's blood, Frank is able to escape the Cenobites and tries to reclaim human form. The effects used in Frank's slow regeneration are pretty awesome. He is completely skinless and looks like he'd make a good Body Worlds Exhibit. He needs human victims to able to continue the regeneration process and with Julia wanting her dead lover back helps him. She lures a handful of unsuspecting businessmen to their death. So where is Larry in all this? Completely oblivious and unaware that anything is wrong, so basically a typical 80s movie husband. Kirsty does get suspicious when she sees her stepmom with another man. While at the house looking for her dad, she discovers the new frank and is able to steal the puzzle box. Frank ups his search for some skin and sort of reunites with his brother Larry. That's right Franks is now wearing Larry's skin and is out to kill Kirsty and reclaim the puzzle box. While investigating the box Kirsty accidentally summons the Cenobites and to save her own life she offers to give them Frank. 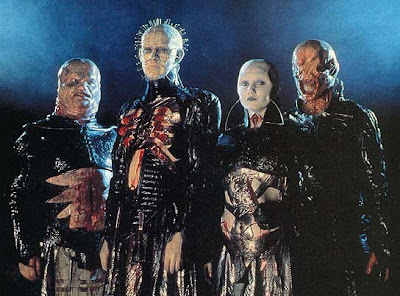 The Cenobites "Will tear your soul apart" says Pinhead the leader of the group along with a female with her throat opened up. There is also "Butterball" and the "Teeth Chatterer". As I said, in the beginning, the ending is pretty dated and done on the cheap, but the movie as a whole is a true horror classic. To date, there are eight sequels out there all starring Pinhead. Anything after number three and you watch at your risk.